1. 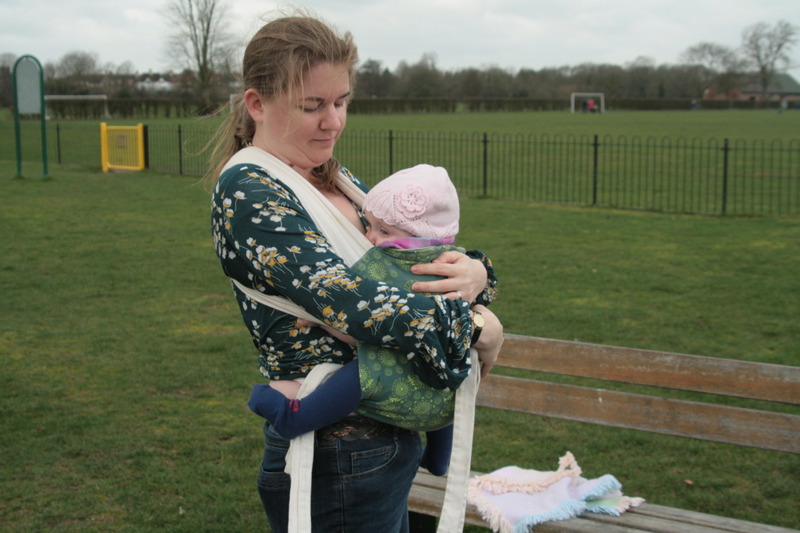 You can breastfeed in a sling hands-free. 2. Babies love to sleep in a sling because they can hear your heart beat and feel all warm and snuggly while you get on with your day. 3. You can hold the baby, calm the baby, sing to baby and get chores done all at the same time. 4. Going for a hike is easy with a sling, obstacles are easily navigated because you have use of all four limbs. 5. The baby feels included as part of the conversation and has a birds eye view of the world. 6. Slings are great in crowds, you can't lose baby in the crowd and you don't have to maneuver a buggy through the throngs. 7. Slings are great for getting through tight places. Much easier when out in the woods, going shopping, walking around National Trust houses with lots of stairs, and shopping centres where lifts are few and far between. You can leave the buggy at home. 8. 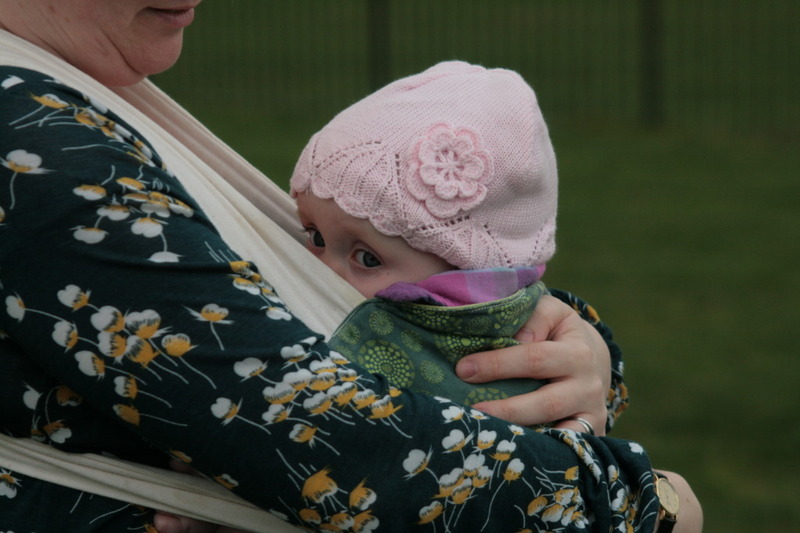 Slings are great when you have older kids because you have two hands free to push a swing, push a buggy, hold a hand and catch then before they run across the road. 9. Slings are great when you are out with a friend because two buggy's don't always fit side by side on the pavement so you can walk together instead of in single file. 10. 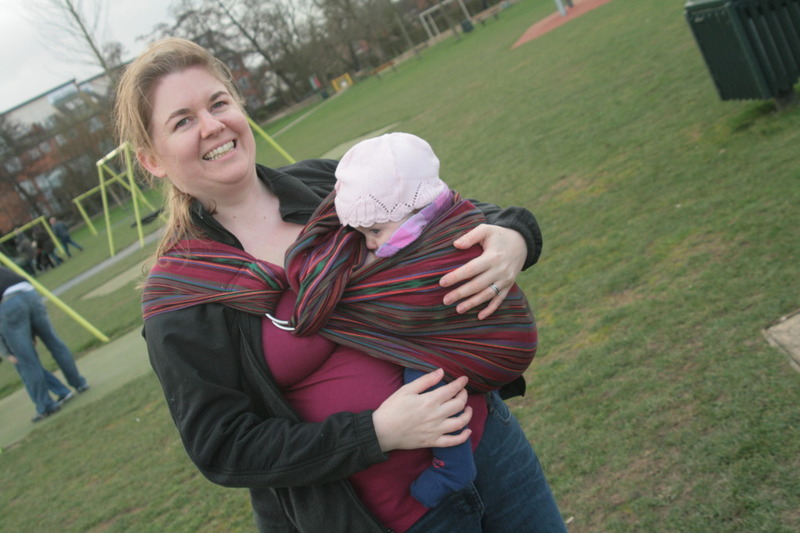 Slings enable you to hold your baby for longer without hurting your arms or back. The weight is spread, and you don't have to stand funny with your hip out. What do you like best about using a sling? I did a really small Baby Show last year which was very poorly attended, and it turned into a bit of a blood bath at the end between the organizer and a disgruntled stall holder (not me). It was an opportunity for me to see how I could handle doing nursing bra fittings at an event. Out of the twenty people who came through the door, five were fitted and bought nursing bras. It showed me yet again that there is a real market for well fitting nursing bras, and also that I really needed a second person to help me out so that I could focus on the fittings and not worry about missing people as they sail past. The Sussex Baby & Toddler show was held in Hastings at the Hastings Centre (near Conquest Hospital) on Saturday March 10th from 10-4pm. Over 1000 women and their families attended and it was a lot of fun. It was extremely hard work. I drove down to Hastings the day before to set up. I had an amazing space as you can see, I even had a very professional looking fitting room with spotlights and some great display racks which hung from the walls and provided tonnes of hanging space without cluttering the floor. I also had the priveledge of sponsoring the breastfeeding room which I wish I had taken a photo of. It had comfy chairs, flowers and water provided by the organizer (Teresa) which I was allowed to add to. After asking the kind readers of The Lactivist and Dispelling Breastfeeding Myths I decided to take along some foot stools, pillows, toys for the lids, breastfeeding info, magazines and some decorations. The magazines were kindly donated by JUNO, and the artwork on show were large canvases of little Ellie nursing in public. The day went by really fast. The stall was right at the entrance, so we met loads of really great pregnant and breastfeeding Mums as they entered and shopped and left the event. There were loads of activities for the kids to do while parents shopped, a bouncy castle, messy play, face painting....... and bacon rolls for anyone who was hungry (yummy). I'm so glad that we went. I spoke to lots and lots of women who have already had not so great experiences with nursing bras, and it was nice to be able to share my experience with them. You don't have to spend a fortune on nursing bras to be comfortable throughout your pregnancy and breastfeeding journey, prices start at just £10. You don't need to be fitted and but new bras every 4-6 weeks as many women are being told on the High Street, there are many bras out there that can accomodate changes in breast and band size. So, I did overstock the shop as you can probably tell from the picture. My first big show and I didn't want to run out of anything. So, I am now sitting at the computer surrounded by nursing bras and nursing vests that need to go so I can see the floor again. Please pop over to my website to take advantage of my Mother's Day Sale going on NOW. Take advantage of this great deal and shipping is of course FREE when you spend £50! Treat yourself to a new Deluxe Emma-Jane 830 Nursing Vest which has a much higher cotton content and feels incredible to wear. The Show attendees LOVED them. If you missed out on the Baby Show you missed out on meeting GEORGE!! and here he is with my Mum. Have a fabulous first Mother's Day. I remember my first Mother's Day. I was walking across the street towards the supermarket in Maryland, USA. Dodging traffic with William in a sling because the footpaths aren't really seen as a necessity, everyone else drives to the supermarket. As a huge SUV passed us on the street the passenger leaned out of her window and yelled "Happy Mother's Day! ".